The Kingdom of Ayutthaya was the major power in Southeast Asia in the 14th and 15th centuries. Based in the capital of Ayutthaya on the Chao Phraya River, this decentralized Thai kingdom managed to exercise hegemony over the area for many years. Trade rivalry with Malacca and constant wars with neighboring Burmese kingdoms and the declining Khmer Empire typified the history. Ayutthaya starts as a tributary of Ming. They have two vassals, Sukhothai and Ligor, Ligor following the Sunni faith. Ayutthaya is an excellent option to play as a semi-beginner, as the country is not in Europe and is not a major, but can expand without many difficulties as it is stronger than all of its neighbours. Ayutthayan events are mainly focused on reforms. Reforms can give monarch points, base tax in provinces, etc. Ayutthaya starts off in a very good situation. The country is a tributary nation of Ming, which means it will have to give yearly tributes in exchange for China's protection from outside invaders. Consequently, Ayutthaya will likely never have to worry about surprise invasions from India or the Europeans. However, tributaries may war among themselves without provoking the wrath of China, so the kingdoms of Burma and Indochina are free to engage in wars of conquest without external interference. Ayutthaya must take advantage of this to secure regional dominance and grow in power. Even without taking its vassals into account, Ayutthaya is the strongest kingdom in Southeast Asia, which makes it the prime contender for uniting Indochina. Another significant starting advantage is the fact that Ayutthaya has cores on its subjects, so it can seize territory immediately and, after ten years, can annex the vassals for no cost. On the downside, Ayutthaya has a weak starting ruler and its main trade node, Siam, is fairly poor. Setting up a solid trading network will require lots of conquest and investment in naval supremacy. Ayutthaya's natural enemy is Khmer. Historically, Khmer was the major power of the region before Ayutthaya overtook it a few years before the start of the EUIV era. Ayutthaya has one of Khmer's cores, which will almost always lead to an immediate rivalry, but Khmer is the weaker of the two and should not be a huge problem. It holds the other trade power province of the Siam node, so conquering Khmer in two swift early wars will significantly boost Ayutthaya's income. Other strong powers are Lan Xang to the North-East and Dai Viet even further to the North-East. The other neighbours are smaller states, Pegu to the West and Lan Na to the North. Besides that, Ayutthaya is surrounded by its vassals Sukhothai and Ligor. The only states relatively even in strength are Malacca and Bengal but Ayutthaya has time to expand and become stronger than them before any confrontation begins. Ayutthaya can defeat any individual neighbour alone, but if several of them ally, it is probably safer to ally some other states nearby. Dai Viet or Lan Xang will provide the most help, especially to crush the other, but having one or two of any of the states in Indochina as an ally will almost guarantee easy victories against any neighbour no matter how many allies they have. Manpower will be a critical issue in the earlier stages of the game. The tropical terrain of Southeast Asia will significantly reduce provincial supply limits, and Ayutthaya does not enough manpower to replace catastrophic losses easily. The player should take care not to lose too many troops to attrition. Ayutthaya's national ideas reduce the high maintenance costs of mercenaries, so hiring them can help save on manpower. Once the other kingdoms in Indochina have been annexed or vassalized, the early game is over and the time for Ayutthaya's expansion into the greater world will have arrived. 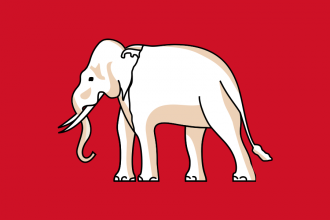 The White Elephant: After becoming the unquestioned main power by defeating Khmer and other nearby powers, the player is probably close to getting the achievement The White Elephant. Bear in mind that the achievement's text is inaccurate; both Indochina and Burma must be controlled for it to fire. Chittagong, one of the required provinces in Burma, is owned by Bengal at the start of the game. Bengal is very likely to become a significant power as time goes on, so a player seeking the achievement should try to take the province before Bengal grows too strong. Remember also that Ming may step in and take one or two provinces in Indochina or Burma. If that happens, the player will have no choice but to eventually confront Ming. A natural expansion path for Ayutthaya that almost or totally united Indochina and Burma would be to try to set up a trade network more efficient than what you have. An extremely good node to control is thus Malacca, far superior to Siam and also the only node towards which Siam flows, so you don't waste your early game money. That requires you to conquer many nations, many of them stronger than what you were used to, like Malacca or Brunei. You should be in a position where you are still stronger than them, but getting a good navy will be needed to control the area, full of islands. Allying a state like Pasai or Majapahit can also help getting an early edge if the player choses to expand in that direction. From there, you can decide to smooth up your borders and play a colonial/trade oriented game around the Spice Islands with idea groups like Exploration, Expansion and Trade. Either Religious or Humanist is probably needed to deal with the numerous Sunni land you will conquer. Another road is to go towards India. There are many strong nations there but also a lot of riches. A more agressive player could decide to conquer all of India or the eastern part of it, which proves to be more of a challenge but is still relatively easy, considering Ayutthaya has easier expansion paths than the other strong Indian powers. The player should still be careful if he is blocked by an alliance of two or three strong Indian powers and get alliances of his own or wait for good opportunities. Good idea groups are everything useful for conquest, like Administrative and Influence, and several military groups, especially Offensive. Buddhist nations are eligible to form Bharat, so by cultureshifting to Bengalese (for instance), you can form the state relatively early and get free claims on all of India. The last objective and the hardest one can be pursued immediately or after the others, depending on the challenge you want to face. Ayutthaya follows an eastern religion, which means they can claim the Mandate of Heaven from Ming with the proper DLC. Even without it, Ming is the obvious power of the area, and defeating them can be a nice endgoal for a campaign. This requires either massive expansion towards Indonesia or India to get a strong powerbase, or a careful plan and many allies, as Ming is extremely strong. Ayutthaya is still one of the non-horde countries with the most potential to overthrow Ming and create an alternate history in which the Imperial power shifted to the South. For this, stacking military ideas and strong policies is needed. Defensive is an obvious choice to win battles thanks to the morale boost, as is Quantity to overcome their massive numbers. This page was last edited on 4 July 2018, at 18:18.